Wow Kolkata is a brand-new Bengali eatery, nestled in a leafy by-lane of Kalyani Nagar. Whether you’re a home-sick Bengali living in the city, or just a food lover with a wandering palate – a visit here will be worth your while. Barely 2 weeks old, Wow Kolkata is run by entrepreneur Partha Chatterjee, and his uncle Deepak Chhabria. Since Bengalis are renowned for their delicious fish dishes, Partha wanted to introduce these traditional preparations to Puneites in an authentic way. Wow Kolkata offers outdoor and indoor seating, with simple monochromatic decor and warm lighting. On the menu are freshwater (river water) and saltwater fish like ilish, bhola, pomfret, hilsa, bhekti (subject to availability), as well as crab, chicken, and mutton preparations. The focus here is certainly on the seafood, and Partha tells us that they make sure to source and use the freshest catch possible. There are also no artificial colours used here – and all the spice mixes and masalas are made in-house by Wow Kolkata’s own Bengali staff. We tried the ‘pabda jhaal’ – pabda fish cooked with Bengali spices; prawn jhaal, and the ‘chanar dalna’ (homemade ‘chana’ – i.e. malai cakes – curry) which were lip-smacking good. Other dishes we can’t wait to go back for, are the kosha mangsho (of which there are 3 types on the menu), mutton chaap, and mutton ‘Dak bungalow’ – the latter being a combo of Bengali herbs and spices, and egg. Bonus points: don’t miss Wow Kolkata’s own Bengali-style thalis, with options for both vegetarians and meat-eaters. We think their ‘Rajar Thali’ (King’s Thali) – which serves 17 food items and can feed up to three people – would be a great way to explore Bengali cuisine with your friends or family. 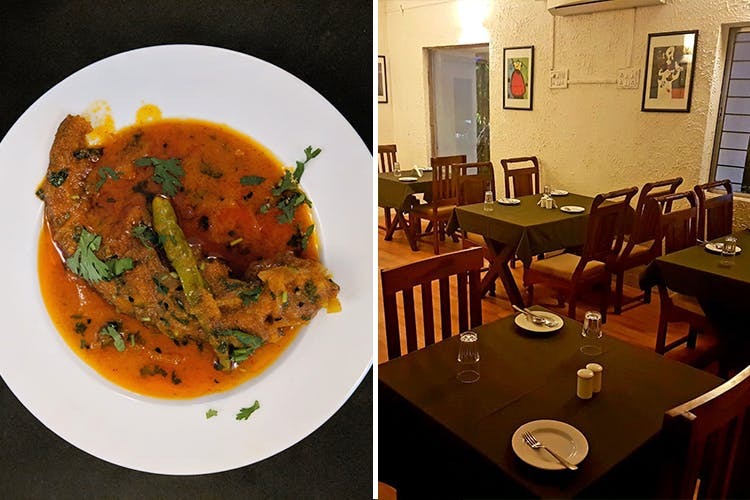 For fussy eaters, Wow Kolkata also has a smaller section of the menu dedicated to Indo-Chinese and Indian Tandoori fare, but we think the highlight here is definitely their Bengali seafood. Unfortunately, there aren’t any Bengali desserts on the menu yet, but Partha tells us they will figure out the logistics for that, soon. Wow Kolkata is located just around the corner from Cafe Pondi, opposite Tvum – in Kalyani Nagar. You can find them on Facebook here. Biryani lovers, we hear their Kolkata-style Dum Biryani is worth a try, too!